Shoes for Little Feet is having a December blowout on all Umi shoes and boots - get 25% off with coupon code UMIBLOWOUT. They guarantee orders must be placed before December 22, 2010. FREE shipping on orders over $30 to Canada and the USA. Shop this deal at www.shoesforlittlefeet.com. 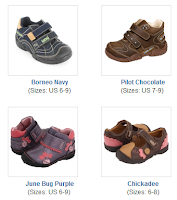 0 Response to "25% Off Umi Shoes at Shoes for Little Feet, Free Shipping with $30 Order"